Recent discs from Marc-André Hamelin have concentrated on music which is obscure, under-recorded or virtually unplayable. However in this latest recording he turns his attention to two mainstays of the Romantic repertoire: Chopin’s Piano Sonatas Nos 2 and 3. The results are simply staggering: playing of matchless brilliance and consummate artistry, stunningly recorded. As a recent critic of Hamelin’s live performance of the B minor sonata remarked, ‘Hamelin starts where most other pianists leave off … such was his control that frequently it seemed as though an extra dimension were being added, the music’s teeming internal life clarified by his ability to voice the inner parts’. The disc is completed by some of Chopin’s greatest single-movement works; the contrasting two Nocturnes of Op 27, the extraordinarily colouristic Berceuse Op 57 and the monumental Barcarolle in F sharp major. We think this is one of the most authoritative and important Chopin discs to have appeared in recent years—an unmissable release. The genre title ‘nocturne’ was fairly commonplace in early nineteenth-century piano music, influenced no doubt by the enhanced cultural status of the night (famous texts by Novalis and Madame de Staël), and also by the growing importance of the salon as a site of pianism. Initially it was applied to a wide diversity of pieces, but in the hands of John Field and Chopin it came to be associated with a pianistic style shaped by vocal imitation, whether of the French romance or the Italian aria. By the time Chopin came to compose his Nocturnes Op 27 in 1835, the genre was already a well-established one, with the archetype of the ‘nocturne sound’—ornamental melody supported by widespread arppeggiations—firmly in place. The Nocturnes of Op 27 are broadly conformant, but they did mark an intriguing change in how Chopin presented this genre to the world. From this point onwards, he published his Nocturnes in contrasted pairs rather than in groups of three, giving greater weight to the individual pieces within an opus but at the same time preserving a sense of their mutual compatibility. 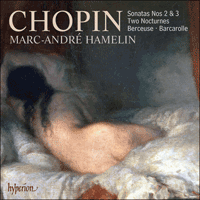 Chopin was happy to perform the individual Nocturnes of Op 27 separately (especially the second, which he played in Paris, England and Scotland), but he conceived them as perfectly complementary, with the darkly brooding C sharp minor of the first (James Huneker referred to ‘the gloomiest and grandest of Chopin’s moody canvasses’) transformed enharmonically into the consolatory, oneiric D flat major of the second. That these were pieces of exceptional artistic quality was immediately recognized when they were published in 1836, not least by Schumann in the pages of Neue Zeitschrift für Musik, where he described them as exemplifying a ‘new wave’ of piano music. There are two formal principles underlying a good deal of Chopin’s music, and they are neatly exemplified by the two Nocturnes of Op 27. The C sharp minor relies on contrast. It is an expansive ternary design in which the middle section steps up the tempo and even more the drama, culminating in a brief waltz-like episode (another typical gesture; compare the First Ballade and Second Scherzo). The D flat major, on the other hand, is through-composed and goal-directed, and its construction is immensely subtle. There are two alternating melodies, of which the first is non-repetitive and aria-like, elaborated with an ever more expressive ornamentation, but remaining essentially static, if music can ever be static. The energy and momentum is provided by the second, stanzaic melody, which is developmental in character. Here the ornamentation has a rather different function. It is not so much an expressive enhancement of the melody as a means of driving the music in a dynamic and evolutionary way towards its major tension points; in other words it plays a key structural role in the music. Taken together, the two themes represent Chopin’s ornamental melody at its finest. The opera house was one obvious influence; Mozart another. Two years after composing the Op 27 Nocturnes, Chopin wrote a Marche funèbre (1837). It was shortly after his hopes of marriage to Teresa Wodzin´ska had been dashed, but perhaps we should be cautious about inferring too much from that. At any rate two years later, during the summer of 1839 (the first of the seven highly productive summers he spent at George Sand’s country estate at Nohant in the French provinces), he wrote a further three movements to complete his Piano Sonata No 2 in B flat minor Op 35. The work was published the following year (1840). This time Schumann was not so generous. His reference to the four movements as ‘four unruly children smuggled under this name into a place they could not otherwise have penetrated’ is intriguing. As a criticism it is hardly fair, criticizing Chopin for failing to achieve something that was never really in his sights, but at the same time it does point to what is really singular about this work. Of course it is possible to relate it to the historical archetype of the Austro-German sonata (the overall shape, with the funeral march following rather than preceding the scherzo, is close to Beethoven’s Op 26, a sonata that Chopin taught and played), but really Chopin was trying to create something quite different: a new kind of sonata, albeit based on the old kind. Essentially he used the sonata genre as a framework within which the achievements of his earlier music—the figurative patterns of the Études and Preludes, the cantilenas of the Nocturnes, and even the periodicity of the dance pieces—might be drawn together in a kind of synthesis. It is possible, for example, to analyse the first movement as a sonata form with the inverted reprise that is so characteristic of Chopin (compare the Ballades). But equally it is possible to hear it as a double cycle where figurative patterns are followed by cantilenas. Moreover, just as Nocturnes are embedded in the first movement in this way, so another Nocturne is trapped within the Scherzo and yet another haunts the middle section of the funeral march. In neither of these inner movements does the central song feel like a natural outgrowth of the flanking sections. It remains remote from them, strengthening our impression of a series of contrasted, relatively self-contained musical worlds juxtaposed rather than smoothly joined. And in this reading the notorious finale assumes the character of a baroque-like Étude or Prelude (compare Nos 14 and 19 from the Op 28 Preludes). This in no way diminishes the powerful affective quality of the sequence, where the funeral march yields first to the detached, otherworldly song of its ‘trio’, and then to the disintegrative, harmonically elusive, and purposefully insubstantial finale. But it does reinforce (in a positive way) the gist of Schumann’s observation. The components of this work are formally separated, albeit thematically linked. The Piano Sonata No 3 in B minor Op 58 works rather differently. It was the last of Chopin’s three piano sonatas, written in 1844 during the years of his full maturity as a composer, and in contrast to the ‘Sonata funèbre’ it moves closer to conformity with both the formal and the generic archetypes of what was already becoming recognized as German sonata-symphonic thought. It is as though having come to terms with the four-movement sonata in Op 35, approaching it obliquely by way of the familiar ‘Chopin genres’ of the early 1830s, the composer now felt able to tackle this weighty genre on its own terms. This is apparent in the close-knit motivic argument—the developing variation—of the first movement, and in the measured tread—late Beethoven, late Schubert—of the slow movement. There are some parallels with Op 35, including the sequence of the inner movements where the scherzo precedes the slow movement, and again the inverted reprise of the first movement, but in most respects the two works are poles apart. The outer movements point up the contrast. There could be nothing further from the elliptical, understated finale of Op 35 than the grandiloquent sonata rondo with which Op 58 races, or rather gallops, to its bravura coda. This at least is a more conventional way to end a sonata! As for the first movement, this presents us with a much more closely argued thematicism than its counterpart in Op 35. The principal theme is strong and distinctive, but it is quickly broken down into motivic-contrapuntal working in a process of continuous development and transformation that then characterizes much of the movement. Considerable heads of tension are built up by this process, both in the exposition and in the development, and it is the function of the Nocturne-like second theme—one of Chopin’s happiest inspirations—to resolve them. A few months before he completed the B minor Sonata, Chopin put the finishing touches to his Berceuse Op 57. The original title was Variantes, and this describes its final form rather well: a set of sixteen short variations on an ostinato ground (there is a sketch of the work that lays this structure out rather graphically, even numbering the ‘variantes’). Another interesting detail here is that Chopin originally intended to plunge straight into the melody, and only added the two-bar genre-defining introduction at a late stage, quite possibly at the moment he changed the title from Variantes to Berceuse. In some ways the work functions rather like a set of baroque ‘divisions’, but this scarcely does justice to the highly original treatment of the ornamental line. The key point is that the curve of complexity (ever more rapid filigree) remains divorced not just from the underlying harmonic progression (a simple repeating cycle) but also from the dynamic shape (a stable level, remaining in low dynamics throughout). What is original here is that the shape of the music—its sense of departure and return—is created almost entirely through texture and sonority. It is not hard to see why Debussy was so interested in the music of Chopin. In the final years of his short life, Chopin reached a new plateau of creative achievement. His sketches from these years suggest that the agony of composition, the resistance it set up, wrested from him only music of an exceptional, transcendent quality. And nowhere is this clearer than in the three great extended works of 1845–6: the Barcarolle Op 60, Polonaise-Fantasy Op 61 and Cello Sonata Op 65. When he composed his only Barcarolle, artistic appropriations of this popular genre (effectively a gondolier’s song) were to be found mainly in opera, but there were also examples in Lieder (as, for example, in Schubert’s Auf dem Wasser zu singen and Auf dem See), and some in post-classical traditions of popular pianism (including some of Mendelssohn’s Songs Without Words: the ‘Gondellied’ in A major and ‘Venetian gondolieras’). However, piano works with this title were invariably simple in design and texture, and usually a straightforward transfer from the operatic genre. So Chopin’s monumental work, with its complex formal organization, was quite unlike anything else in piano music at the time, though it did of course set a precedent (Liszt, Fauré, and many others). A unique synthesis of extended ternary form, sonata form and fantasy, the Barcarolle is separated from its sentimental archetype by an unbridgeable gulf. And the gulf is widened and deepened by some of Chopin’s most sophisticated harmonies, including lengthy chromatic modulations that are seemingly without a clear tonal goal, and a use of dissonance that extends well beyond classical norms. At the same time—and this makes the work all the more powerful—the composer retains the principal outward features of the popular genre: the 12/8 metre, the moderate tempo, the measured, ostinato-like, rocking accompaniment and the cantilena melodic line led in double notes (mostly thirds and sixths). It is worth noting that these generic features do appear in several earlier works by Chopin, including all four Ballades and above all the G major Nocturne Op 37 No 2, really a barcarolle in disguise. But in the end Op 60 stands as a solitary masterpiece, carrying the gentle swaying lyricism of the vernacular genre through to the powerfully climactic perorations of its final stages. Nocturne» était un titre assez répandu dans la musique de piano du début du XIXe siècle, sans doute sous l’influence du statut exhaussé de la nuit (les fameux textes de Novalis et de Madame de Staël) et de l’importance croissante du salon comme lieu de pianisme. Au départ, il s’appliquait à un large éventail de pièces mais, entre les mains de John Field et de Chopin, il fut peu à peu associé à un style pianistique forgé par l’imitation vocale de la romance française ou de l’aria italienne. Lorsque Chopin composa ses Nocturnes op. 27, en 1835, ce genre était déjà bien établi, avec un archétype du «son de nocturne»—une mélodie ornementale étayée par de larges arpègements—fermement installé. Ces standards, les Nocturnes de l’op. 27 les respectent grosso modo, tout en marquant un curieux changement dans la manière dont Chopin présenta ce genre au monde. Dès lors, il publia ses nocturnes non par groupes de trois mais sous forme de diptyques contrastés, donnant aux différentes pièces un poids accru tout en préservant le sens de leur compatibilité mutuelle. Il était heureux de jouer ces Nocturnes séparément (surtout le second, qu’il interpréta à Paris, en Angleterre et en Écosse), mais il les conçut dans une parfaite complémentarité, l’ut dièse mineur sinistrement inquiétant du premier (James Huneker parla du «plus lugubre, [du] plus grandiose des canevas maussades de Chopin») se muant enharmoniquement en un ré bémol majeur consolant, onirique dans le second. L’exceptionnelle qualité artistique de ces pièces fut reconnue dès leur parution en 1836, et Schumann lui-même y vit, dans les pages de la Neue Zeitschrift für Musik, l’illustration d’un «nouveau courant» de la musique pianistique. Les Nocturnes de l’op. 27 exemplifient nettement deux principes formels qui sous-tendent une large part de la musique chopinienne. Celui en ut dièse mineur repose sur le contraste. C’est un plan ternaire expansif dans lequel la section centrale accroît le tempo et, plus encore, le drame, culminant en un bref épisode à la valse (autre geste typique; voyez la Ballade no 1 et le Scherzo no 2). Celui en ré bémol majeur, en revanche, est continu, tendu vers un but, avec une construction infiniment subtile, où deux mélodies alternent. La première, non répétitive et de type aria, est étoffée avec une ornementation toujours plus expressive mais demeure foncièrement statique, si tant est qu’une musique puisse jamais l’être. L’énergie et l’élan viennent de la seconde mélodie strophique, qui a le caractère d’un développement. Ici, l’ornementation a une fonction un rien différente—elle n’est pas tant un exhausteur expressif de la mélodie qu’un moyen de pousser la musique vers ses points de tension majeurs, d’une manière dynamique et évolutive; en d’autres termes, elle joue un rôle structurel clé. Pris ensemble, ces deux thèmes incarnent le meilleur de la mélodie ornementale chopinienne. L’opéra fut une influence patente; Mozart en fut une autre. Deux ans après ces Nocturnes op. 27, Chopin écrivit une Marche funèbre (1837)—ses espoirs de mariage avec Teresa Wodzin´ska venaient d’être réduits à néant, mais veillons peut-être à ne pas en tirer trop de conclusions. Quoi qu’il en soit, deux ans plus tard, durant l’été de 1839 (le premier des sept étés fort productifs qu’il passa dans la propriété de George Sand, à Nohant), il lui ajouta trois mouvements pour compléter sa Sonate no 2 en si bémol mineur op. 35, publiée l’année suivante (1840). Cette fois, Schumann ne se montra pas aussi généreux et évoqua les quatre mouvements en ces termes: «quatre enfants indisciplinés entrés clandestinement sous ce nom dans un lieu où ils n’auraient, sinon, jamais pu pénétrer». C’est une critique assez injuste, qui reproche à Chopin de n’avoir pas atteint une chose à laquelle il n’a jamais vraiment aspiré, mais qui met aussi le doigt sur ce qui fait la véritable singularité de cette œuvre. Certes, on peut la rattacher à l’archétype historique de la sonate austro-allemande (sa forme globale, avec la marche funèbre qui ne précède pas, mais suit, le scherzo est proche de celle de la Sonate op. 26 de Beethoven, que Chopin enseigna et joua), mais Chopin tenta vraiment de créer quelque chose de complètement différent, un genre de sonate tout à la fois nouveau et fondé sur l’ancien modèle. Il utilisa surtout la sonate comme un cadre à l’intérieur duquel les réalisations de sa musique passée—les schémas figuratifs des Études et des Préludes, les cantilènes des Nocturnes, et jusqu’à la périodicité des morceaux de danse—pourraient être réunies en une sorte de synthèse. Ainsi le premier mouvement peut-il être analysé comme une forme sonate dotée de la reprise inversée si typiquement chopinienne (voyez les Ballades). Mais il peut tout autant être perçu comme un double cycle, où des schémas figuratifs sont suivis de cantilènes. De la même manière que les Nocturnes sont enchâssés dans le premier mouvement, un autre Nocturne est piégé dans le scherzo et un autre encore hante la section médiane de la marche funèbre. Jamais, dans ces mouvements internes, le chant central ne semble une excroissance naturelle des sections latérales; il demeure éloigné d’elles, renforçant notre impression d’une série d’univers musicaux contrastés, relativement autonomes, juxtaposés plutôt que uniment liés. Vu sous cet angle, le célèbre finale revêt un caractère d’Étude ou de Prélude façon baroque (voyez les nos 14 et 19 des Préludes op. 28). Ce qui n’amoindrit en rien la puissante qualité affective de la séquence où la marche funèbre cède d’abord devant le chant détaché, éthéré, de son «trio» puis devant le finale désagrégateur, harmoniquement insaisissable et délibérément insubstantiel. Mais cela renforce (positivement) le fond de la remarque de Schumann: les composantes de cette œuvre sont formellement séparées mais thématiquement liées. La Sonate pour piano no 3 en si mineur op. 58, la dernière des trois sonates pour piano chopiniennes, fonctionne un peu différemment. Écrite en 1844 par un Chopin au summum de sa maturité compositionnelle, elle se conforme davantage que la «Sonate funèbre» aux archétypes formels et génériques de ce qui était déjà en passe d’être reconnu comme l’idée «sonato-symphonique» allemande. C’est comme si, après s’être colleté à la sonate en quatre mouvements avec l’op. 35, après l’avoir abordée indirectement par le biais des «genres chopiniens» bien connus du début des années 1830, le compositeur se sentait enfin prêt à attaquer cet important genre, tel quel. Ce qui transparaît dans l’argument motivique très uni—la variation de développement—du premier mouvement et dans le pas mesuré—Beethoven tardif, Schubert tardif—du mouvement lent. Il y a certains parallèles avec l’op. 35, notamment la séquence des mouvements internes où le scherzo précède le mouvement lent et, une fois encore, la reprise inversée du premier mouvement, mais, pour l’essentiel, les deux œuvres sont aux antipodes l’une de l’autre, comme le soulignent les mouvements extrêmes. Rien ne saurait être plus éloigné du finale elliptique, discret, de l’op. 35 que le rondo de sonate grandiloquent via leqel l’op. 58 court, ou plutôt galope, jusqu’à sa coda de bravoure. Violà, au moins, une manière plus conventionnelle de terminer une sonate! Quant au premier mouvement, il nous offre un thématisme bien plus argumenté que celui de l’op. 35. Le thème principal est fort et distinctif mais il est vite décomposé en une écriture motivico-contrapuntique par un développement et un changement continus qui marquent ensuite l’essentiel du mouvement. De considérables sources de tension s’accumulent au cours de ce processus, dans l’exposition et dans le développement, et il revient au second thème, de type nocturne—parmi les plus heureuses inspirations chopiniennes—de les résoudre. Quelques mois avant d’achever sa Sonate en si mineur, Chopin mit la dernière main à sa Berceuse op. 57, dont le titre original (Variantes) donnait une assez bonne idée de sa forme définitive: un corpus de seize courtes variations sur une basse en ostinato (une esquisse dispose cette structure d’une manière assez graphique, allant jusqu’à numéroter les «variantes»). Autre détail intéressant, Chopin entendait initialement plonger droit dans la mélodie et ce fut tardivement, sans doute au moment du changement de titre, qu’il ajouta les deux mesures introductives définissant le genre. À certains égards, l’œuvre fonctionne un peu comme une série de «divisions» baroques, mais cette comparaison ne rend guère justice au traitement fort original de la ligne ornementale: la courbe de complexité (un filigrane toujours plus rapide) reste coupée non seulement de la progression harmonique sous-jacente (un simple cycle périodique), mais de la forme dynamique (un niveau stable, toujours dans les graves). L’originalité ici, c’est que la forme de la musique—l’impression de départ et de retour qu’elle donne—vient presque exclusivement de la texture et de la sonorité. On voit bien pourquoi Debussy s’intéressa tant à la musique de Chopin. Dans les dernières années de sa courte vie, Chopin atteignit un nouveau palier de réalisation créative. Ses esquisses de ces années-là nous montrent combien la composition lui fut un supplice, lui résista, ne le laissant arracher qu’une musique exceptionnelle, transcendante. Ce qui ne ressort nulle part mieux que dans ses trois vastes œuvres de 1845–6: la Barcarolle op. 60, la Polonaise-Fantaisie op. 61 et la Sonate pour violoncelle op. 65. Lorsque Chopin écrivit ce qui fut son unique barcarolle, c’était surtout l’opéra qui s’était approprié ce genre populaire (un chant de gondolier), dont on rencontrait cependant quelques exemples dans des lieder (comme dans Auf dem Wasser zu singen et dans Auf dem See de Schubert) et dans certaines traditions postclassiques du pianisme populaire (ainsi le «Gondellied» en la majeur et «Gondoliers vénitiens», deux Romances sans paroles de Mendelssohn). Mais ces barcarolles pianistiques présentaient toutes un plan et une structure simples, se contentant généralement d’être un transfert du genre opératique. Aussi l’œuvre monumentale de Chopin, avec sa complexe organisation formelle, n’avait-elle pas d’équivalent dans la musique pianistique de l’époque, même si elle créa, bien sûr, un précédent (imité par Liszt, Fauré et beaucoup d’autres). Synthèse unique de la forme ternaire développée, de la forme sonate et de la fantaisie, la Barcarolle est séparée de son archétype strophique sentimental par un gouffre au-dessus duquel aucun pont ne saurait être jeté. Et ce gouffre est élargi, approfondi par certaines des harmonies les plus sophistiquées de Chopin, notamment de fort longues modulations chromatiques apparemment sans but tonal clairement défini et un usage de la dissonance bien au-delà des normes classiques. Dans le même temps—et cela rend l’œuvre d’autant plus puissante—, le compositeur conserve les principaux critères extérieurs de ce genre populaire: le mètre à 12/8, le tempo modéré, l’accompagnement berçant, mesuré, de type ostinato, et la ligne mélodique de la cantilène en doubles notes (surtout des tierces et sixtes). Il vaut de souligner que ces caractéristiques figurent dans plusieurs œuvres antérieures de Chopin, comme dans ses quatre Ballades et, surtout, dans son Nocturne en sol majeur op. 37 no 2—en réalité, une barcarolle déguisée. Mais, en définitive, l’op. 60 apparaît comme un chef-d’œuvre isolé, charriant le doux lyrisme berceur d’une barcarolle typique à travers les péroraisons puissamment paroxystiques de ses ultimes stades. Die Genrebezeichnung „Nocturne“ war in der Klaviermusik des frühen 19. Jahrhunderts relativ verbreitet. Das lag einerseits sicherlich an der kulturellen Aufwertung des Themas Nacht (Novalis und Madame de Staël haben dazu Schlüsseltexte verfasst), andererseits aber auch an der zunehmenden Bedeutung des Salons als Schauplatz der Klavierkunst. Zunächst wurden die verschiedensten Stücke mit dem Titel „Nocturne“ versehen. Später jedoch, hauptsächlich durch die Werke von John Field und Chopin, wurde „Nocturne“ mit Klavierwerken in Verbindung gebracht, die Vokalwerke—genauer gesagt: französische Romanzen oder italienische Arien—imitieren. Als Chopin 1835 seine Nocturnes op. 27 komponierte, war das Genre bereits etabliert und der typische „Nocturne-Klang“—eine verzierte Melodie mit weitgestreckten Arpeggierungen—bekannt. Zwar können die Nocturnes op. 27 unter diesen Kriterien grob eingeordnet werden, doch markieren sie gleichzeitig einen interessanten Wendepunkt, was Chopins Behandlung des Genres anbelangt. Von da an veröffentlichte er seine Nocturnes nicht mehr in Dreiergruppen, sondern als Paare, wobei die beiden Stücke jeweils völlig unterschiedlicher Natur sind. Auf diese Weise werden die einzelnen Stücke innerhalb eines Opus stärker hervorgehoben und gleichzeitig ihre Vereinbarkeit miteinander bewahrt. Chopin spielte die Nocturnes des op. 27 durchaus auch einzeln (insbesondere das zweite, das er in Paris, England und Schottland darbot), doch hatte er sie als zwei komplementäre Stücke angelegt: einerseits das düstere, grüblerische cis-Moll des ersten Werks (das James Huneker als „das düsterste und großartigste der launischen Gemälde Chopins“ bezeichnete), das sich dann enharmonisch in das tröstliche, traumartige Des-Dur des zweiten verwandelt. Dass diese Stücke von höchster künstlerischer Qualität waren, wurde sofort erkannt, als sie 1836 herausgegeben wurden—nicht zuletzt von Schumann, der sie in der Neuen Zeitschrift für Musik als eine beispielhafte neue Welle der Klaviermusik beschrieb. Vielen Werken Chopins liegen zwei formale Prinzipien zugrunde; dies wird in den beiden Nocturnes op. 27 besonders deutlich. In dem cis-Moll Werk spielen Kontraste eine wichtige Rolle. Es hat eine weitläufige, dreiteilige Anlage, wobei im Mittelteil das Tempo und die Dramatik intensiviert und in einer kurzen, walzerähnlichen Episode (eine weitere charakteristische Geste; vgl. die Erste Ballade und das Zweite Scherzo) der Höhepunkt erreicht wird. Das Des-Dur Stück jedoch ist durchkomponiert, zielgerichtet und äußerst subtil angelegt. Es treten zwei sich abwechselnde Melodien auf. Die erste ist arienartig, ohne Wiederholungen, wird mit zunehmend ausdrucksvollen Verzierungen ausgeschmückt, bleibt jedoch mehr oder minder statisch, sofern man Musik als statisch bezeichnen kann. Die Energie und Bewegung geht von der zweiten, strophenartigen Melodie aus, die sich stets weiter entwickelt. Hier haben auch die Verzierungen eine andere Funktion. Sie verstärken nicht so sehr den melodischen Ausdruck, sondern führen eher die Musik auf dynamische und fortschreitende Weise zu den großen Spannungspunkten hin, spielen also eine wichtige strukturelle Rolle. Zusammengenommen repräsentieren diese beiden Themen Chopins verzierte Melodie in besonders fein ausgearbeiteter Form. Neben Mozart hatte die Operntradition hierbei einen wichtigen Einfluss. Zwei Jahre nachdem er die Nocturnes op. 27 komponiert hatte, schrieb Chopin eine Marche funèbre (1837). Kurz zuvor hatten sich seine Hoffnungen, Teresa Wodzin´ska zu heiraten, zerschlagen, doch sollte man vielleicht nicht zuviel in diesen Umstand hineininterpretieren. Wie dem auch sei, er schrieb zwei Jahre später, im Sommer 1839 (der erste von sieben besonders produktiven Sommeraufenthalten auf George Sands Landsitz in Nohant, in der französischen Provinz), drei weitere Sätze, mit denen er seine Klaviersonate Nr. 2 in b-Moll op. 35 vervollständigte. Das Werk wurde im folgenden Jahr (1840) veröffentlicht. Diesmal war Schumann nicht so großzügig. Es ist interessant, dass er die vier Sätze mit vier Kindern gleichsetzt, die unter fremdem Namen an einen Ort geschmuggelt worden seien, den sie sonst nicht erreicht hätten. Es scheint mir unfair, Chopin anlasten zu wollen, dass er etwas nicht erreicht, wenn er es doch nie beabsichtigt hatte, doch deutet Schumanns Vergleich auf eine charakteristische Eigenheit des Werks hin. Natürlich kann man es auch mit dem historischen Archetyp der österreichisch-deutschen Sonate in Verbindung bringen (die Anlage der Sonate und die Tatsache, dass der Trauermarsch dem Scherzo folgt und nicht vorangeht, erinnert an Beethovens op. 26, eine Sonate, die Chopin selbst spielte und auch unterrichtete), doch wollte Chopin in Wirklichkeit etwas ganz anderes erreichen. Ihm strebte eine neue Art der Sonate vor, die aber auf der herkömmlichen fußen sollte. Er verwendete quasi das Genre Sonate als Gerüst, in das er die Errungenschaften seiner früheren Werke—die Figurationsmuster seiner Etüden und Préludes, die Kantilenen der Nocturnes und sogar die Periodizität der Tanzstücke—einsetzte, um eine Art Synthese zu schaffen. Es ist zum Beispiel möglich, den ersten Satz als Sonatenhauptsatzform mit umgekehrter Reprise, die für Chopin so charakteristisch ist, zu analysieren (vgl. auch die Balladen). Ebenfalls kann man hier jedoch einen Doppelzyklus heraushören, in dem auf Figurationsmuster Kantilenen folgen. Und genauso wie Nocturnes in den ersten Satz eingefügt sind, so ist noch ein Nocturne im Scherzo eingefangen und ein weiteres spukt durch den Mittelteil des Trauermarschs. Weder in dem einen noch im anderen Innensatz entwickelt sich das zentrale Lied auf natürliche Weise aus den es umgebenen Passagen. Es ist gewissermaßen distinkt und so verstärkt sich der Höreindruck, dass es sich hier um eine Reihe von verschiedenartigen, relativ eigenständigen, nebeneinander gestellten musikalischen Welten handelt und nicht eben ineinander übergehende Passagen. Mit dieser Interpretation im Hinterkopf nimmt das berüchtigte Finale den Charakter einer barockähnlichen Etüde oder eines Préludes an (vgl. Nr. 14 und 19 aus den Préludes op. 28). Dies schwächt die stark affektive Eigenschaft der Reihenfolge keineswegs; hier wird der Trauermarsch zunächst von dem losgelösten, jenseitigen Lied des „Trio“ fortgeführt, und dann von dem aufgelösten, harmonisch schwer fassbaren und absichtlich substanzlosen Finale. Hier findet sich, allerdings in positiver Weise, das Wesentliche von Schumanns Beobachtung wieder. Die Bestandteile dieses Werks sind formal getrennt, aber thematisch miteinander verbunden. Die Klaviersonate Nr. 3 in h-Moll op. 58 ist ganz anders aufgebaut. Es ist dies die letzte der drei Klaviersonaten Chopins, die alle 1844 entstanden, als er als Komponist seine endgültige Reifeperiode erreicht hatte. Anders als die „Sonate funèbre“ ist diese Sonate dem formalen und generischen Archetyp des sich bildenden deutschen Sonaten- und Symphoniekonzepts näher. Es scheint, als ob er nach der viersätzigen Sonate op. 35, in der er sich der Sonatenform verdeckt und über „Chopin Genres“ der frühen 1830er Jahre genähert hatte, sich nun in der Lage fühlte, dieses gewichtige Genre offen anzugehen. Dies wird nicht nur in der eng gearbeiteten Motivik, der sich entwickelnden Variation, des ersten Satzes deutlich, sondern auch im gemessenen Schritt—später Beethoven, später Schubert—des langsamen Satzes. Es gibt einige Parallelen mit op. 35, wie etwa die Reihenfolge der Innensätze, wo das Scherzo dem langsamen Satz vorangeht, und auch die umgekehrte Reprise des ersten Satzes, doch davon abgesehen trennen diese beiden Werke Welten. Die Außensätze zeigen die Kontraste besonders deutlich auf. Nichts könnte sich von dem elliptischen und absichtlich schlicht gehaltenen Finale von op. 35 mehr unterscheiden als das hochtrabende Rondo, mit dem op. 58 auf seine Bravur-Coda zuprescht. Es ist dies jedenfalls eine konventionellere Art und Weise, eine Sonate zu Ende zu bringen. Im ersten Satz finden wir eine deutlich stringentere Thematik vor als im Pendant von op. 35. Das Hauptthema ist kräftig und markant, wird jedoch schnell in ein motivisch-kontrapunktisches Geflecht geleitet, was dann in einen fortwährenden Entwicklungs- und Transformationsprozess übergeht, der den Satz dann weitgehend dominiert. In diesem Prozess bauen sich sowohl in der Exposition als auch in der Durchführung beträchtliche Spannungspunkte auf, und es ist die Aufgabe des nocturneartigen zweiten Themas—einer der schönsten Einfälle Chopins—diese aufzulösen. Wenige Monate bevor er die h-Moll Sonate fertigstellte, beendete Chopin seine Berceuse op. 57. Der ursprüngliche Titel des Werks lautete Variantes, was auch die endgültige Form passend charakterisieren würde: es handelt sich um einen Zyklus von 16 kurzen Variationen über einen Ostinato-Bass (es ist eine Skizze des Werks überliefert, in der die Struktur deutlich angegeben ist und wo die „Variantes“ sogar durchnummeriert sind). Ein weiteres interessantes Detail hierbei ist, dass Chopin ursprünglich direkt in die Melodie eintauchen wollte, und erst später die zweitaktige, genreverleihende Einleitung anfügte, möglicherweise geschah das zum selben Zeitpunkt, als er auch den Titel von Variantes zu Berceuse änderte. In mancherlei Hinsicht ist dieses Werk mit barocken Figurationen vergleichbar, doch wird das der hochoriginellen Behandlung der verzierten Linie kaum gerecht. Das entscheidende Charakteristikum ist, dass die Komplexitätskurve (immer schneller und filigraner) nicht nur von dem darunter liegenden harmonischen Fortschreiten (ein schlichter, sich wiederholender Zyklus) sondern auch von der dynamischen Gestalt (ein stabiler Pegel, der durchweg niedrig bleibt) völlig getrennt bleibt. Was hierbei so originell ist, ist, dass die Gestalt der Musik—der Eindruck von Aufbruch und Rückkehr—fast ausschließlich durch Struktur und Klang erzeugt wird. Es ist nicht schwer nachzuvollziehen, warum Debussy sich so für die Musik Chopins interessierte. In den letzten Jahren seines kurzen Lebens erreichte Chopin eine neue Qualität seines kreativen Erfolgs. Seine Skizzen dieser Jahre deuten darauf hin, dass das Komponieren eine Qual für ihn war und einen Widerstand in ihm hervorrief, von dem er sich nur befreien konnte, wenn seine Musik ein außergewöhnliches, transzendentales Niveau erreichte. Dies wird in den drei großen Werken von 1845–46 besonders deutlich: die Barcarolle op. 60, die Polonaise-Fantasie op. 61 und die Cellosonate op. 65. Als er seine einzige Barcarolle komponierte, waren künstlerische Annäherungen an dieses populäre Genre (praktisch ein Gondoliere-Lied) hauptsächlich in der Oper zu finden. Es gab auch einige Beispiele in Liedern (wie zum Beispiel in Schuberts Auf dem Wasser zu singen und Auf dem See) und ein paar post-klassische, populäre Klavierwerke (darunter eine Reihe von Mendelssohns Liedern ohne Worte, die jeweils den Titel „Venezianisches Gondellied“ tragen). Klavierwerke mit diesem Titel hatten jedoch ausnahmslos eine einfache Anlage und Struktur und waren zumeist direkte Übertragungen aus dem Operngenre. So stellte Chopins monumentales Werk mit seiner komplexen Anlage im Klavierrepertoire der damaligen Zeit eine völlige Neuheit dar, die später freilich von Komponisten wie Liszt, Fauré und vielen anderen nachgeahmt wurde. Die Barcarolle ist eine einzigartige Synthese aus dreiteiliger Form, Sonatenhauptsatzform und Fantasie und von dem sentimentalen, strophischen Archetyp durch eine unüberbrückbare Kluft getrennt. Diese Kluft wird durch Chopins subtile Harmonien und lange chromatische Modulationen, die scheinbar kein klares tonales Ziel haben, sowie Dissonanzen, die weit über klassische Normen hinausgehen, noch erweitert und vertieft. Gleichzeitig—und dies macht das Werk umso gewaltiger—behält der Komponist die wichtigsten äußeren Merkmale des Genres bei: das 12/8 Metrum, das gemäßigte Tempo, die gemessene, Ostinato-artige, wiegende Begleitung und die Kantilene in der Melodielinie, die hauptsächlich in Terzen und Sexten geführt wird. Es ist interessant festzustellen, dass alle diese generischen Eigenschaften schon in früheren Werken Chopins auftauchen, wie in allen vier Balladen und insbesondere im G-Dur Nocturne op. 37 Nr. 2, was eigentlich eher eine versteckte Barcarolle ist. Letztendlich steht das op. 60 jedoch als meisterliches Unikat da, in dem die sanft wiegende Lyrik der Umgangssprache in kunstvolle Rhetorik verwandelt und zu einem gewaltigen Höhepunkt geführt wird.